Volatile organic compounds (VOCs) attract the attention of the authorities due to their detrimental effects on environmental and human health. People are exposed to odor problems, which live in close vicinity of the emission sources. This is the most obvious effect of these emissions. In order to manage and control the emissions, released compounds at least should be monitored at source and receptor points. So that, source contributions can be evaluated. Landfilling is the most frequent method used in Turkey to manage and dispose the solid wastes. Although, engineering methods during and after the landfilling process minimizes the undesired effects of the wastes in the environment, odorous compounds released to the atmosphere still remains as a serious problem. Especially, people living in the surrounding residential areas are the most vulnerable ones. Sampling was conducted in the European side of Istanbul. Sampling points were selected to be inside the landfilling facility and residential areas where are reported to be exposed to odor from landfilling activity. Passive sampling method was used in this study. Sample tubes were placed in the area at least for ten days. Then, these tubes were brought to laboratory for further processing and quantification. VOC species were detected and quantified by GC-MS.
Total VOC concentrations were ranged between 50 and 850 ppm. The VOC species with the highest concentrations were m&p xylene, 1,2,4-trimethybenzene, 1,4-diethylbenzene, n-decane, n-undecane. Concentrations observed in summer were considerably higher than in winter. The highest concentrations were observed in active landfilling lot, leachate waste water collection tank and composting facility.
.	A. Saral, S. Demir, and Ş. Yıldız, “Assessment of odorous UOBs released from a main MSW landfill site in Istanbul-Turkey via a modelling approach”, J Haz Mat, vol 168, pp 338-345, 2009.
.	M. A. Parra, D. Elustondo, R. Bermejo, and J. M. Santamaria, " Exposure to volatile organic compounds (UOB) in public buses of Pamplona, Northern Spain ", Sci Tot Environ, vol 404, pp 18-25, 2008.
.	S. C. Zou, S. C. Lee, C. Y. Chan, K. F. Ho, X. M. Wang, L. Y. Chan, and Z. X. Zhang, "Characterization of ambient volatile organic compounds at a landfill site in Guangzhou, South China", Chemosphere, vol. 51, pp. 1015-1022, 2003.
.	Q. Liu, M. Li, R. Chen, Z. Li, G. Qian, T. An, and J. Fu, "Biofiltration treatment of odors from municipal solid waste treatment plants", Waste Management, vol. 29, pp. 2051-2058, 2009.
.	F. Dinçer, M. Odabaşı and A. Muezzinoğlu, "Chemical characterization of odorous gases at a landfill site by gas chromatography-mass spectrometry", J Chrom A, vol 1122, pp. 222-229, 2006.
.	A. Muezzinoglu, "A study of volatile organic sulfur emissions causing urban odors", Chemosphere, vol. 51, pp. 245-252, 2003.
.	F. Karaca, "Istanbul'un tarihi yarımadasında yüzey yayılım profilinin araştırılması", Hava Kirliliği Araştırmaları Dergisi, vol. 1, pp. 53-65, 2012.
.	E. Woolfenden, "Sorbent-based sampling methods for volatile and semi-volatile organic compounds in air Part 1: Sorbent-based air monitoring options", J Chrom A, vol. 1217, pp. 2674-2684, 2010. ISNAD Saral, Arslan . "Odorous Volatile Organic Compounds Determined Inside the ISTAC Landfilling Facility and Places at Close Vicinity by Passive Air Sampling Method". 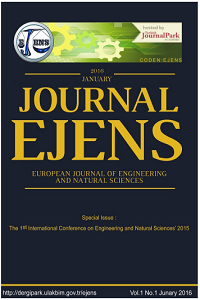 European Journal of Engineering and Natural Sciences 2 / 1 (February 2017): 56-63.